This book has been out for ages. It has been in the shop for ages. It won the Forward Poetry prize for best collection last year. So why am I writing about it now? I am writing about it because I can’t stop thinking about it, and because it opened something profound in my head. Because it added to my intellectual toolkit and challenged the way I think about racism. Because I have bought it for others. Because I recommend it all the time but still can’t really find words to adequately describe it, and because it’s not like anything else I’ve ever read. 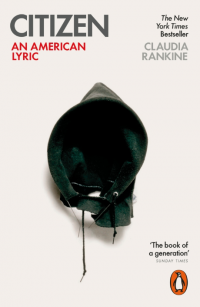 Rankine writes with honesty and great style about racism, both as experienced in her personal life and in public life. She tells stories which are both effortlessly relatable and deeply shocking, the more for being truthful – for example, she arrives for an appointment with a new therapist who screams at her to get out of her yard before realising that she is, in fact, a client. Her work benefits from being heard aloud, as much poetry does. I heard her perform this piece (https://www.poets.org/poetsorg/poem/citizen-vi-train-woman-standing ) and it was like an electric shock ran through the room waking everyone up. Her pieces about Serena Williams alone are worth buying Citizen for. The book itself is a beautiful object, with art and photographs scattered throughout. It’s not a comfortable read, but transformative books rarely are.